We recommend a diet of no vegetables. Instead, offer nutritious Tortoise Food made for desert tortoises. Grassland Tortoise Food provides all the necessary nutrients and fiber. Your tortoise can also enjoy dandelions, grass, and ornamentals so be sure to plant these. Most deficiencies are from diets low in Vitamin A, Calcium, Protein, and Fiber. The challenge is to provide these nutrients without giving excessive sodium, or giving more phosphorus than calcium. A calcium to phosphorus ratio of 2: 1 is good. Grassland is a complete tortoise food. No vitamins, minerals, or vegetables need to be added. It’s easy and worry-free! Soften Tortoise Food with water for 2 or 3 minutes using a ratio of about 1 part Tortoise Food to 11/2 parts water. Watch the video about preparing Tortoise Food. Some tortoises need a little time and coaxing to accept a new food. Try mixing a little of their previous food with Tortoise Food. Gradually reduce that food until you serve only Tortoise Food. Please remember that it is very difficult to provide a complete diet using a vegetable salad as a base unless you know the exact nutrients to add in the correct amounts (vitamins, minerals, trace elements, and sufficient protein, and fiber). 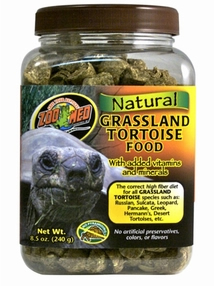 Grassland Tortoise Food by ZooMed is the same nutritious food you knew and your tortoise loved as MegaDiet RF. SODIUM. Most fresh vegetables contain only 1 to 10 milligrams of sodium per 100 grams of the food. Canned vegetables average 236 mg per 100 grams!! Sodium is added to some frozen foods. Avoid: canned and frozen vegetables, dairy products, breads, and celery. SPINACH has nutrients but also contains OXALIC ACID. Oxalic acid binds calcium making it UNAVAILABLE to the system. Avoid spinach. Also avoid beet greens and Swiss chard for the same reason. BROCCOLI, KALE, COLLARDS and MUSTARD GREENS (of the cabbage family) have valuable nutrients but depress the thyroid. Goiters can develop from heavy use of the cabbage family. NO CAT FOOD OR DOG FOOD. They may cause digestive problems because the fiber content is too low for tortoises. NO SWEET FRUIT OR CORN. The sugars in these foods predispose desert tortoises to intestinal parasites. NO FROZEN VEGETABLES especially for young tortoises. Some nutrients are lost when foods are frozen. Frozen carrots and broccoli are rubbery and corn is not healthful because of the sugar. Some frozen vegetables have added sodium.